Hey there! We are so excited to be back for Day 5 of the 12 Days of Christmas! For Day 5, I chose to make a Wooden Ornament Tree and it is completely COLLAPSIBLE! It’s always hard to pack decorations away after Christmas and I thought that making this collapsible would be so helpful come January! This hand saw is the perfect tool for this project! If you don’t have a saw, this is the right place to start and will only cost you $10! Purchase 3 round dowels at Home Depot. Cut them down to the measurements above. Purchase a 2×2 at Home Depot and cut down to measurements above. You will need a 1/2 drill bit for the next step. Drill holes at the marked measurements on one side of the 2×2. Tip: I drew a line down the middle of the board to keep holes in the center. Flip board to the right once and drill holes at the measurements above. Cut a scrap 1×8 at 7.25”. If you don’t have a scrap, you can purchase a 1×8 at your local hardware store. Drill a hole into the center of the 1×8. Drill a hole in the center of the 2×2. Attach 1×8 and 2×2 with a wood screw through the bottom of the 1×8. Drill another hole at the top of the 2×2. Purchase a wood finial at Lowe’s. I chose to paint my tree in a favorite, Rust-oleum Heirloom White spray paint. I found it easiest to spray paint the dowels while they were in the tree. Tip: place dowels from longest to smallest from bottom to top to form the shape of a Christmas Tree. I would love for you to share this with your friends and PIN it of course!! https://uploads.disquscdn.com/images/4647fa1832e14d6b2a2ae0f959b8009b21220e7ef45c97128dfc159ee1d9fb4c.jpg Thank you so much for this post and all the directions! 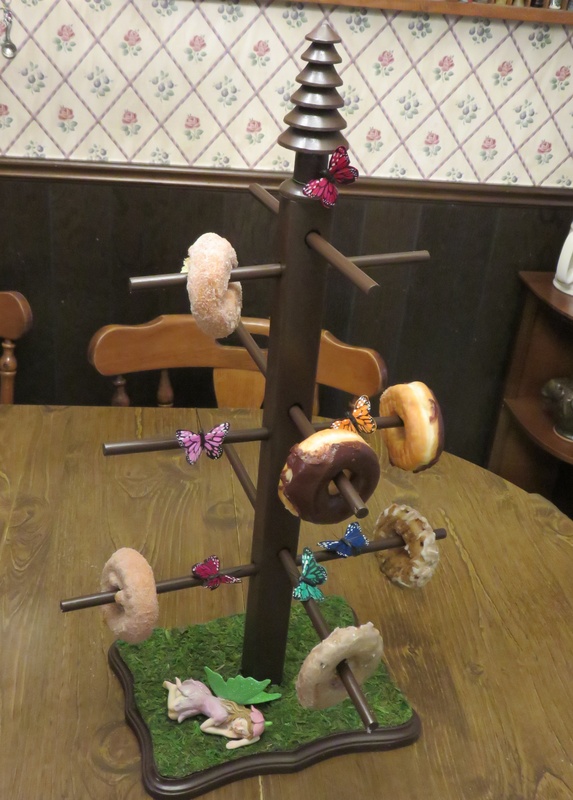 We scaled it down to a smaller size, and made it into a “donut tree” for our granddaughter! It was perfect for what we were looking for! And it’s gorgeous with the Christmas ornaments on it, too! Thanks again! Any tips on drilling that big of a hole neatly? Mine split the wood terribly, and it’s a new bit! Ours split, too, even with a new drill bit. We used some wood putty/filler to fill in the splintered areas. Then when it dried, we sanded it before spray-painting it. That worked pretty well. We made a smaller version by removing the bottom layer. It sits well on a table, and has room to hang a dozen things. See my post above for a picture. Thank you for this post! I sell ornaments and this would be a great display for my shop! LOVE this project!!!! I find so many great ideas at your blog. One of which was the banner that I made for Thanksgiving. I’m definitely going to make this tree! It’s not like I have enough Christmas decorations – ha ha! It’s a tree with earrings! Adorable! What a fun little tree! I think this would be a great way to showcase a special collection! You guys have a great knack for making everything look easy. This looks great too. Sweet project! This is so cute!! I’ve always admire these and now I know what to do about it! So simple and adorable! I have those same ornaments and just yesterday dug around and found that same twine you used to hang yours. I didn’t want to buy the hooks when I only needed 7! What a neat idea! It would a nice festive touch to my daughters room and also make a great jewellery “tree” for her growing collection of necklaces and bracelets after Christmas! Very clever! This will be perfect for my old ornaments too fragile for the big tree! Thanks for sharing! I love this ! I made one and discovered that I dont drill level. My drill is old and doesnt have a built in level. Any suggestions on how to keep the holes level so the branches are straight ? Love your site !